This article is part of our Holiday Reads 2013 series. Cosmos is Matt Haig’s recommendation. Matt just published his second book, The Humans. I am getting into science books. At school, I hated science, but I think that was mainly because I had not very inspiring teachers. I didn’t get excited by bunsen burners and forceps and those safety goggles you had to wear. Also, I turned up an hour late for my Science GCSE, meaning I ended up getting an F.
Anyway, my allergy to science changed three years ago when I was on holiday in Sardinia. We were staying in a hotel that had books on the bookshelves, most of which were written in Italian. 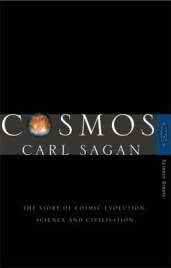 Anyway, one of the few books written in English was Cosmos by Carl Sagan.